After some lineup changes, Sweden's Dream Evil is back with their fourth album, United. Drummer Snowy Shaw and renowned Greek guitarist Gus G. are out of the band, replaced by Pat Power and Mark Black, respectively. United picks up right where The Book of Heavy Metal left off. When Dream Evil first hit the scene with Dragonslayer, their sound consisted of a healthy dose of European power metal in conjunction with traditional, 1980's style heavy metal. By the time The Book of Heavy Metal came out, Dream Evil had almost completely rid themselves of the D&D themes and power metal sounds, evolving into more of a traditional heavy metal band. United continues on in the same vein as their last album, although I do think the quality of the songs has dropped ever so slightly. Still, considering the lineup changes the band has endured, United will vastly exceed most fans' expectations. When I heard the news of the departures (particularly Gus G.), I had expected the band to take a Hammerfall-esque nose dive into mediocrity. Such is definitely not the case. Just like the leadoff track from the last album, United's leadoff track, Fire! Battle! In Metal!, is another "hooray for heavy metal" anthem that Dream Evil have become masters of. Lyrically, it is cheesy as hell, but don't write the track off just because of that. It's actually a powerful and catchy anthem that definitely deserves the leadoff spot on the album. With this track, I breathe a huge sigh of relief knowing that Dream Evil is still very alive and well. While new guitarist Mark Black is a very capable guitarist, he can't fill the shows of Gus G. The dazzling shreds of Gus G. are missing, but Black does deliver some tasty riffs and solos throughout the album. The net difference here in the Mark Black replacing Gus G. factor is really less of a "wow" factor in the songs. The power, melody, and the superb vocals of Niklas Isfeldt are as present and as good as they have ever been. Along with the aforementioned opening track, gems such as Blind Evil, United, Evilution, Let Me Out, and Kingdom of War make for a very powerful opening two thirds of the album. Notably, Blind Evil has a great early 80's era Judas Priest vibe to it, while Let Me Out showcases the powerful side of Dream Evil with its driving riffs, double bass, yet catchy chorus line. 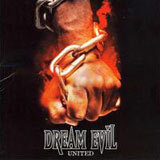 With such variations in their sound, Dream Evil manages not to become repetitive from song to song and manage to sound fresh despite their complete lack of originality. Having said that, the title track and Higher on Fire are decent tracks, but just don't measure up to the level of excellence of the others found on this disc. Also, the energy of the album bottoms out with the ballad Love is Blind. If it were a good ballad, then I would again be hailing the dynamic songwriting of the album that does not go stale. However, this track just plods along without much emotion or memorable qualities. This is the ultimate definition of a lullaby ballad that feverishly demands the skip button. Luckily, the next track, Falling will quickly wake you up and revive your excitement for this album. This is another nod to the melodic power metal side of Dream Evil. Imagine Hammerfall at their peak, but with the much superior vocals Niklas Isfeldt and you get the idea. Mark Black offers one of the better solos of the album during this track as well. Back From the Dead is next, and could have been a truly killer track if it weren't for the chorus line that falls a bit flat. The chugging riffs the power the songs along will bring out the air guitarist in you, while the drum work is particularly excellent on this track. Also, the guitar work and demonish second half of the song are an unexpected twist. Still, the mediocre chorus line dampens my enthusiasm somewhat. Doomlord is the proper end to the album. Aside from a goofy half spoken, half sung section in the middle, this is a strong track with a galloping rhythm and memorable chorus line leading the way. Closing the album is a cover of a pop song performed by the winner the Eurovision contest. It's good for a laugh I guess, but if you stop listening after Doomlord, you won't have missed anything. Despite what I perceived to be a devastating blow to Dream Evil in the loss of Gus G. and Snowy Shaw, the band has bounced back much stronger than I ever would have imagined. Mark Black is definitely no Gus G. as I mentioned above, and that does subdue the "wow" factor that can be heard on earlier albums of the band. Still Black has big shoes to fill, and handles the job in more than just a serviceable manner. If the album were a couple songs shorter, I think the end result would have been even better. Eliminate the filler ballad and one of the mediocre tracks such as Higher on Fire, and you have a rock solid album from start to finish. At the end of it all, I'm ecstatic that my only complaints about this album are relatively minor. Before I actually heard this ablum, I was afraid that the turmoil this band had gone through would lead to their falling far of the map of relevance. How good it feels to be wrong in this instance!